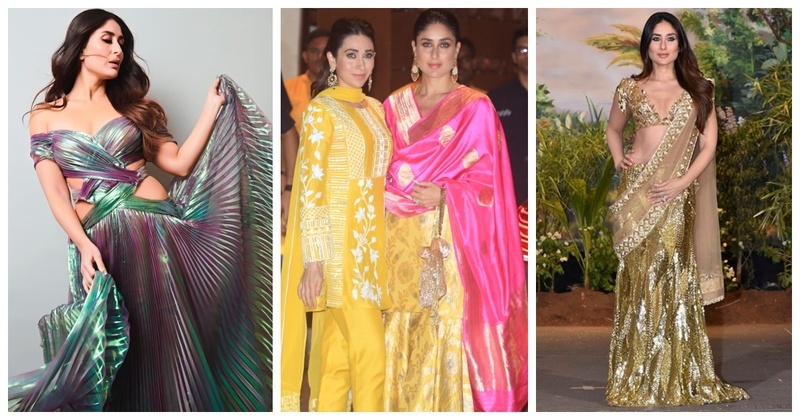 10 Times Kareena Kapoor gave us major Bridesmaid dressing goals! What’s the superlative of ‘most aptly-dressed-fashionista, at-all-times and who slays literally all her looks’? Yes, you guessed it right - Kareena Kapoor Khan. She has never disappointed her fans when it comes to fashion advice and here’s saying, she’s never going to. The Ganesh Chaturthi bash at the Ambani’s saw Bebo dressed in a gorgeous Raw Mango sharara, which got me thinking she’s been giving us major bridal goals all the way. Totally crushing over Kareena’s bright yellow kurta and sharara set from Sanjay Garg’s new collection titled ‘Heer’. She styled it with a pink dupatta featuring a thick golden border and leaf motifs - proving that bright is the way to go with Indian ethnic looks this season. Remember the time when she wore the dazzling golden Manish Malhotra lehenga and outshone everyone, including the bride! The heavily sequined outfit was high on glam and the plunging neckline had us all swooning. She looked pretty damn gorgeous! Kareena Kapoor kept her day-wedding bridesmaid look completely fuss-free and looked her radiant self in a pastel pink Anita Dongre floor-length anarkali. And, I, for one am a fan of this look. I mean, look at Her Royal Highness glimmering in gold. Begum Bebo walked the ramp for Falguni Shane Peacock at the India Couture Week 2018 as the showstopper and I swear, my heart stopped when I saw her walking down the aisle. Oops, I mean the ramp. So, I know it was her bridal look in the movie, but hey that Abu Jani Sandeep Khosla outfit is perfect to wear at your Veere’s wedding too! Kapoor Khan aced her ethnic wear game in a mint-hued anarkali set by Simar Dugal which featured sheer sleeves and a matching dupatta with a thick gota border. Given the subdued colour palette of her ensemble, the golden accents on the anarkali and the dupatta added drama to her evening look, making her look phenomenal. Did you notice that corset style/inspired blouse right there? That’s definitely gonna help turn a lot of heads. That Tarun Tahiliani sharara with intricate work on it, is seriously #WeddingWearGoals! Talk about giving some major #RegalVibes! If you are looking to wear something hatke to wear at your BFF's wedding, then this Monisha Jaising cruising gown is literally the way to go! Well well, after reaching at the end of this blog am pretty sure Bebo gets up in the morning and says, “tumhe koi hak nahi banta itni khoobsurat dikhne ka”.